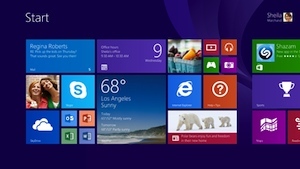 Windows 8 has two environments: the full screen, touch-centric Windows Store App interface (also called Metro) and the Desktop interface, which looks and acts like Windows 7. If you install programs you used on previous versions of Windows (XP, Vista or 7), they will open in the Desktop environment. If you prefer this mode to Windows App, it's possible to work only or mainly in the Desktop. With Windows 8.1, you can skip seeing the Start screen altogether. The biggest difference between Desktop apps and Windows Store apps is that the latter tend to be more touch-friendly, while Desktop apps have smaller menus and icons, so it's more comfortable to use a mouse. Also, in Desktop mode each program operates in a distinct window that can be moved around, resized and minimized (again, like Windows 7). Windows Store apps are full screen. You can split the window to see two apps side by side, but you can't tile four or five apps the way you can in Desktop. Both Desktop and Windows Store Apps can be launched from the Start screen. So once you've set up your computer, spend some time using both types of apps. If you end up spending most of your time using Desktop apps, you'll want to take some steps to remain in Desktop mode as you work and even bypass the Start screen, starting up directly into Desktop. Here's how. On the Start screen, find the Desktop icon and tap it to switch. Right-click the taskbar at the bottom (or tap and hold there for a second to bring up the menu), and click Properties > Navigation. Under Start screen, check the "When I sign in or close all apps on a screen, go to the desktop instead of Start" option, then OK.
Now when you boot Windows or when you close a program, the PC will default to the Desktop and not the Start screen. Even with this setting on, your PC might still enter the Windows Store App environment under some circumstances. Most of the time, this will happen because the default program for opening a file (photos, PDF documents, etc.) is a Windows 8 app. Also, some programs work in both environments and might open in touch mode at first. To avoid this, change file and program defaults. As an example, the Reader app in Windows 8 opens PDF files by default, even if you download Adobe Reader XI. To change this, find a PDF file in the File Explorer, right-click, then choose Open With > Choose Default Program... > Adobe Reader. Be sure that "Use this app with all .pdf files" is checked. This will work with any file type; just download the Desktop app you want to use first. Google Chrome has both a Desktop and a Windows 8 mode and will load in the latter environment if it's the default browser. To change this, click the Menu icon (three horizontal lines in upper right corner) and select Relaunch Chrome on the desktop. Chrome will remember your choice after you close the browser and relaunch in the mode you last used. Look for a similar setting in any other apps that you install in Desktop mode but launch in Windows 8 mode. The Windows 8 Desktop works the same way as Windows 7, including the ability to place program icons anywhere on the desktop and pin icons to the taskbar. In Windows 8.1, there is even a Start Menu, though it doesn't work quite the same. To pin an app to the taskbar, open the program, then right-click (or tap and hold for a second) the icon on the taskbar. Click "Pin this program to the taskbar" in the menu that comes up. Now the icon will stay even after you close the program. To change the background image and colors in Desktop mode, right-click anywhere on the desktop and choose Personalize from the menu that pops up. Here, you can choose from preset themes and colors or create your own. To get a more Windows 7-like Start menu back, you'll have to go with third-party software. There are several options available, but the best is Start8. It costs $5 and has a 30-day trial period. Windows 8.1 is a touch-friendly operating system, though sometimes reaching up to tap the screen isn't the fastest way to get things done. Here are four types of helpful keyboard shortcuts that will save you time on a daily basis. Charms are Windows 8 menus that you can reveal by swiping in from the right edge or down from the top of the screen. You can also activate them with the keyboard. Alt + Tab toggles back and forth between two most recently used apps (including Desktop programs). Keep pressing Tab to cycle through all open apps in last used order. 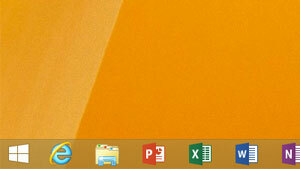 Windows Logo key + Tab toggles between last two Windows 8 Store apps only. Keep pressing Tab to cycle through open apps in last used order. ...but why should you have to buy a third party add on? Microsoft has made more than a few mistakes over the past years. Huge mistakes. Windows 8/8.1 is one of many. I’m recommending that users hold off as long as possible before making the jump to Windows 8/8.1. Hopefully, with new Microsoft management, they will incorporate those third party, user friendly choices into the software. Having to buy software to make Windows 8/8.1 user friendly is ridiculous to me. Microsoft should make the changes—or users shouldn’t support them. Be more vocal about it, people. I thought you were going to suggest that we uninstall it….. I appreciate your advice regarding shortcuts and tips. Those are nice to memorize. I use Start8. It is a nice accessory. However, I am thinking it might be best to delete it and use W8 the way it was designed to be used. I prefer the desktop over the metro and I appreciate the advice regarding the PDF reader. thanks for the useful information. now i am in my desktop. For all those wanting to work with win8 - 8.1 the same way they did in Win7, there is a free program call Classic Shell who turns the interface of Win8 and give you a classic star buttons like win XP - 7, very intuitive and make everything easier for win7 users changing to the new one. Find it comical how “techies” are such whiners about new technology. Sure, Win 8 should be more user-friendly! However, it’s mainly made for touch devices anyways, thus why it’s can be a pain to use as a desktop. As this article states, change a couple settings and you’re fine. It’s unfortunate that the technorazzi rail against things that aren’t that complicated to adjust. If you want a basic interface with no thought needed at all, get a Mac. My laptop crashed and I had to purchase a new one that day, I didn’t think about the windows environment. I have hated Windows 8/8.1, I do not mind change but it has been ridiculous how many clicks that I had to do to use my computer in the same manner. Thanks so much for helping me to tweek it so that it works more efficiently again! Just a couple of observations. jokejustice nailed it when s/he expressed humor over how techno people make such a stink over change. But when one ponders this it becomes obvious that the real problem is that we don’t want to have to take the time (being such a precious commodity) to learn new things so we may proceed with our projects which are already in progress. When new, unexpected issues like this arise during what would otherwise be a smooth and untroubled stream of work it can have major impacts on productivity, the delivery date of a product and the costs related to completing a project. 2 The focus of the accomplished and effective developer is to stay competitive with the competition and still pay attention to what works for the clients of the product(s) in question. In the XP-7 Windows Operating Systems Microsoft had a clear winner in terms if it’s “intuitive” Graphical User Interface (GUI). For Microsoft to completely ignore that was not insightful, and I’ve seen this “disease” many times. The thing that sells software is not market share and it’s not sales people be it OS or other types of applications. What sells software is giving users the functionality they need in an interface environment within which it is easy and intuitive for them to navigate and implement that functionality. How the user relates (internally) to the environment provided and the subject area to which the environment interfaces and the way the user thinks about their tasks and operations within that subject area and how they should connect with each other is absolutely key to the software’s success. Microsoft assumes that because they have a big market share that their users’ opinions don’t matter. Microsoft is wrong in this regard and will learn it through the pain of client losses to operating systems such as Linux for which no one writes virus protection software because no one writes malware or viruses for that operating system or the software it runs. Techs have a job to do and do not want to be bothered with things which use up their productivity on non-productive activities unless they can control those activities. Users are becoming more savvy to computer interfaces and their own personal and business needs. If they are going to have to spend a lot of time with each new release just to maintain their productivity they are going to start looking around for other solutions and those that are persistent will find what they seek and move on leaving Windows in their dust. Thanks for knowing these issues would drive me crazy and excellently communicating the fixes. I got a Dell laptop for my wife, complete with touchscreeen and windows 8.1. ‘m not comfortable with her being forced to use her MSN password to access the computer, especially so because I want to install Dashlane for her. Is there any way around this? I do recommend using a Microsoft account with Windows 8.1 computers. However, it doesn’t have to be your wife’s msn account. You can create a new account that you just use to purchase software through the Windows store (free and paid) and secure the computer. Just go to https://signup.live.com/signup.aspx?wa=wsignin1.0&rpsnv=12&ct=1417709813&rver=6.5.6510.0&wp=SAPI&wreply=https://account.live.com/&id=38936&bk=1417709814&uiflavor=web&uaid=7d3c5a0c724047cb860ff1a68fe26754&mkt=EN-US&lc=1033&lic=1 and select the option to get a new email address. My employer recently gave me a machine w/ Windows 8 and I was ready to throw it against the wall because of the Adobe Reader app. Followed your instructions and can now view my pdfs from the desktop, toggling from the taskbar. Thank U!! Thanks! I’m so glad you found our story useful!